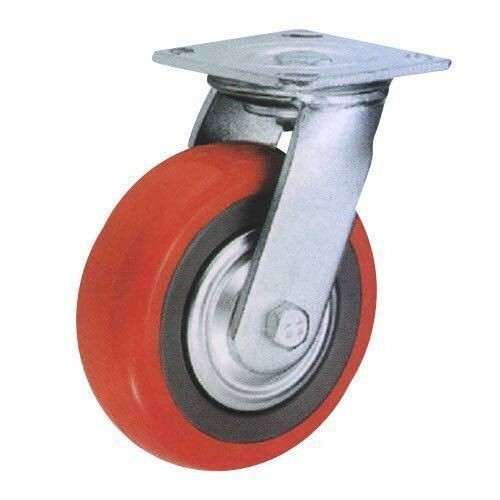 Polyurethane Castors are a topmost wheel tread option available in the market for industrial wheels (castor application or drive wheel application). There are a lot of reasons to choose polyurethane tires for castor applications. Let’s have a look at them. The foremost reason for using polyurethane wheels in industrial applications is its ability to reduce noise. They function noiselessly in contrast to steel or metal, which produces irritating noise. Plus, polyurethane has shock absorbing properties providing a cushioned ride in uneven terrains. Employees can work without losing focus in such an environment. No disturbing sounds can hamper their efficiency. Polyurethane tires have great load bearing potential in comparison to the rubber. That’s the reason for their popularity and usage. Along with load bearing property, polyurethane also offers the same benefits of the rubber tread likewise floor protection, noise level reduction, and shock absorption. Polyurethane tires are a suitable choice in those applications where floor maintenance has to be required. They deflect and creates a much larger footprint when compared to harder wheel materials like nylon. As a result, the stress concentration on floors dramatically reduces and helps to keep floors in good condition for long. So, if you have expensive flooring, it is best to go with the polyurethane tires. A number of polyurethane based material available that possess different resistance level against corrosive chemicals, and other solvents. For a humid and wet environment, polyurethane is a smart choice as it does not corrode or break in water exposure for a prolonged time. A coefficient of friction of polyurethane is medium and that what makes it highly grippy. This helps in towing carts right side up. Harder wheel materials slide faster on a smooth floor, but that’s not the case with polyurethane wheels. It offers a good amount of traction that is needed to move wheels and decreases load as well to get the right driving force. So, these are some of the popular benefits of polyurethane tires in an industrial wheel and castor applications. Fair to say that switching to polyurethane tires is impactful in terms of smooth business operations. For any plans to buy castors in Brisbane, do a good amount of research from your end before making a choice. Do you have some more benefits in knowledge? Share it in the comment box below! What Is Corporate Training and Why Do You Need It?